I have never tought how much my everyday makeup costs until other day when I could not find a space on my vanity to fit a few more makeup products. That was the time I decided to calculate how many products I usually use on a daily base and how much they cost. Let's start from a primer since that's the first thing I apply after my moisturizer. I recently add this Guerlain L'or Pure Radiance face primer ($74) to my everyday makeup and so far loving it. (you can read my review here _ Guerlain L'Or Pure Radiance Face Primer review). After primer, let's take a look a the liquid foundation: Chanel Vitalumirere Aqua ($50). This is certainly not the best foundation on the market for my dry sensitive skin, but since my bigest disappointment from Bobbi Brown Moisture Rich foundation (read my_ Bobbi Brown Moisture Rich Foundation review), I went back to this Chanel foundation while I'm waiting for my new Dior luiqid foundation to be delivered. I've been using this Lancome Eyeshadow Base in beige ($27) almost 2 months now, I'm going to share with you a full review soon. You may remember this Smashbox Lighting Theory Master Class Palette ($39) that I recently purchased and I'm glad I did (you can read Smashbox Lighting Theory Master Class Palette review). I've been using Lancome mascara and mascara bases for years, right now I use this Lancome Hypnose Drama Full Body Volume Mascara ($27.50 ) and Lancome Cils Booster XL mascara base ($25.50) and love them. This was my first Sephora beauty product purchase, actually. I wanted to see how Sephora Collection makeup product would work for me and I bought this bronzer ($7). I have to say, it's quite nice. I've been using this Mac Mineralize concealer ($22) on and off for about a year. (You can read my MAC Mineralize Concealer review). This is my first ever loose powder. I got this Givenchy Powder Premier Mat&Translucent-finish loose powder ($55) back in February and I absolutely love it. 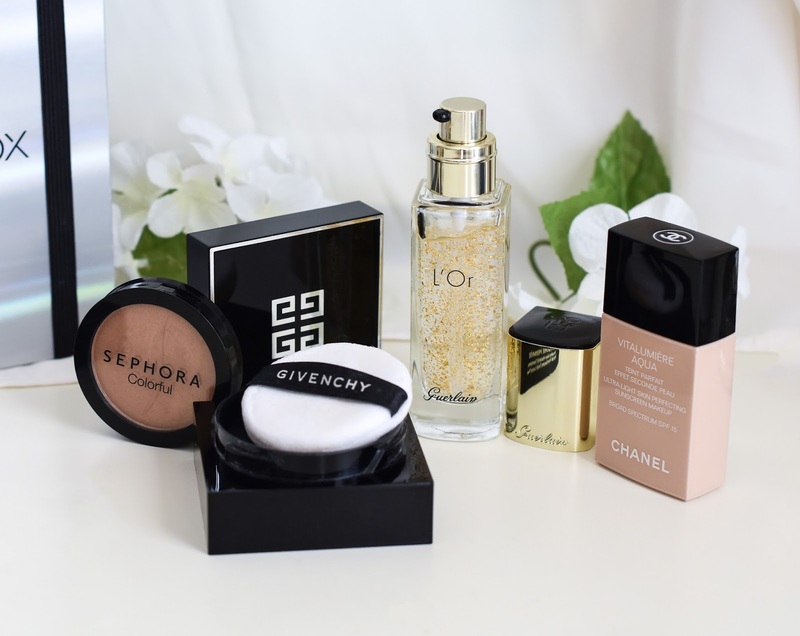 (You can read my Givenchy Poudre Premiere Mat&Translucent-fiish loose powder review). This is my second Sephora beauty product and love it _ Sephora Collection Ultra Shine Lip Gel ($12). I got it in 02 Cappucino, it's so nice color that I apply it over any lipstick I wear. It give my lips some extra shine. And, finally my favorite makeup product _ lipstick and my favorite lipstick _ Chanel Rouge Coco Shine Hydrating Sheer Lipshine ($37). Even though it's sheer, it still lasts for hours and love how hydrating it feels. Here is the verdict: apparantly my everyday makeup costs me $376. 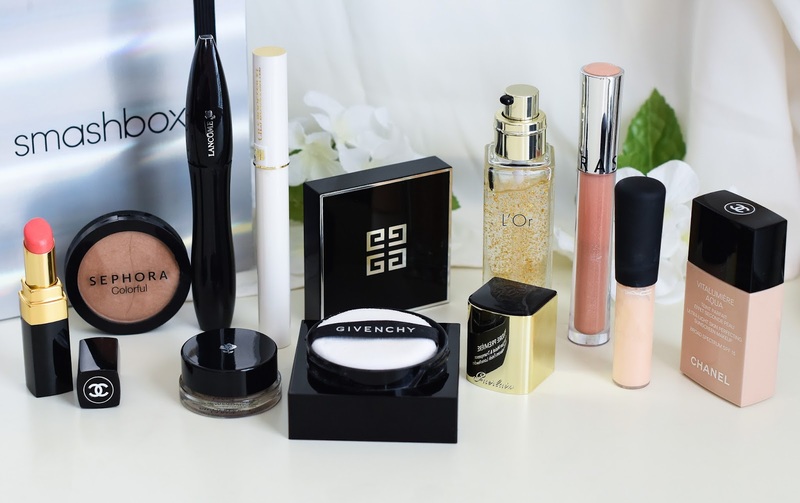 To be honest, I felt little guilty, after I realized how much money I spend on my makeup, and sadly, it still feels like I'm missing so many products LoL..
Do you know how much your every day makeup costs? Let me know in the comments below. P.S. I've been so busy, planning my daughter's 6th birthday party details and invitations that I couldn't post on the blog or social media last week. Hopefully, I will be back on track this week. Thanks for reading beauties, wish you all a fabulous day. You have high end products. I've never actually added up how much my makeup costs but I'm sure that it would be pretty pricey... I consider nice makeup an investment in myself though so I don't feel too bad about spending the money! I am scared to add the dollars on my makeup. Lol! Love all you have here. Would l love to try that bronzer! I did this once and it was terrifying! So, I started looking into the longevity of it and how long I could use it for. I also started finding dupes for products, because I got cheap haha. I do love your makeup collection, so many amazing pieces! Mine would be so much cheaper because I use so little makeup these days! LOL! Wow!!! All products are fantastic!!!! I am having a hard time finding a good foundation. There are just so many and they all do different things. I need to go back to Dior. Great review! Great list! I'd love to try the hydrating lip shine, it sounds divine! Love your make-up! Chanel is my fave! Such gorgeous color palettes! These sound so great! So many amazing products! Love that palette! Oh wow, I've never thought about how much my every day makeup costs. You've inspired me to calculate it out next time! 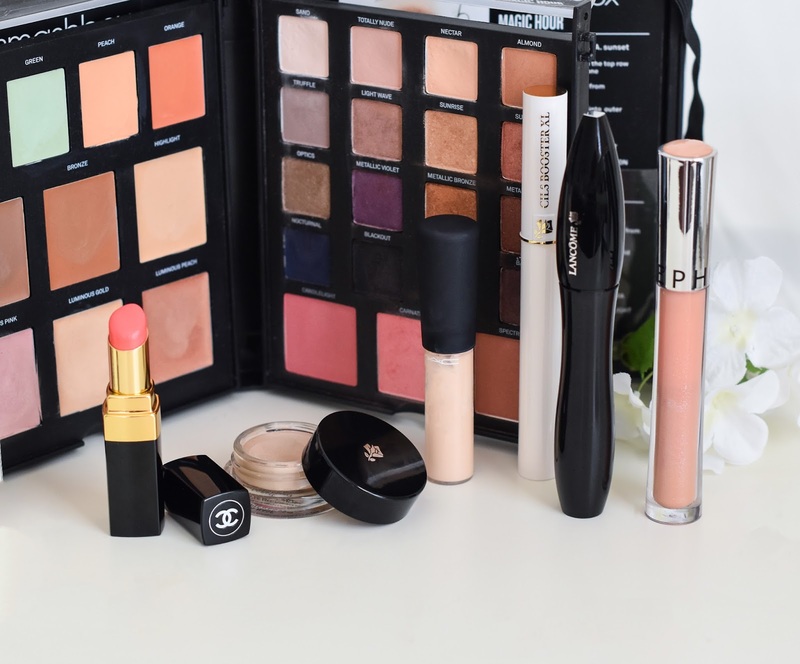 I think it's ok to splurge on makeup since it's so personal and on your face! Better to have high quality products! Everyday make-up costs? I'm not quite sure. I recently bought the Naked palette by Urban Decay and it was worth the money! I love it and use it almost every day. That Chanel lipstick looks absolutely gorgeous! Wow! I would love to shop your stash! Lol. I want new makeup now! Those products are great though, so you shouldn't feel guilty. Haha. Oh, and they last a while also. You are right, at least they last for a while. The L'or face primer looks so amazing. I am going to head over to your review now. I love seeing what other people use because it gives me so many ideas. You use the lancome mascara I used before I switched to Benefit They're Real! I switched because I did a Best Mascaras of 2017. It definitely can get really expensive! There are some great items here though. I really like those lipstick colors. What a great post idea, girlie! I feel the same way about my clothing. There have been times when I've gone shopping and struggled to find hangers or placement of them in my wardrobe and was forced to take inventory of what I had and what I wore the most seasonally. It's such a great thing to do because it really gives you an idea on what products are worth the splurge and investment and which ones we don't need any more of. That said, your products seem wonderful, some of which I've heard of, non of which I've tried. I'll have to check out Chanel's lipsticks, many seem to love them. Thanks for sharing and I hope you're having a great week so far!